Lucille Wait, Betty Boyd, Shirley Sanders, Dorothy Wait, Janith Boyd, Arthur Austin, Billy Boyd and King. Dr. Gutfruend and his granddaughter Shirley lived in this house which originally belonged to the Sloneks. Later it was called Under the Pines. Photo courtesy of CSMyers. John Love finished a driven well (machine pounded rather than by hand) on Thursday, October 1. Ken McBride was over to play with Jim Leavenworth on Saturday. They often got together in October. The middle of October Garfield Leavenworth started remodeling their kitchen for Ella’s new stove. Three days later, Ella had moved into her kitchen and the new stove was set up. Kate Love visited again. Garfield started work for Walter Tether. At the end of October Garfield worked for Dr. Gutfruend. Dr. Gutfruend and his granddaughter Shirley Sanders lived in the old Slonek house that would one day be called, Under the Pines. Perhaps Garfield did some repairs on the old house. Garfield did put shingles on his own porch. 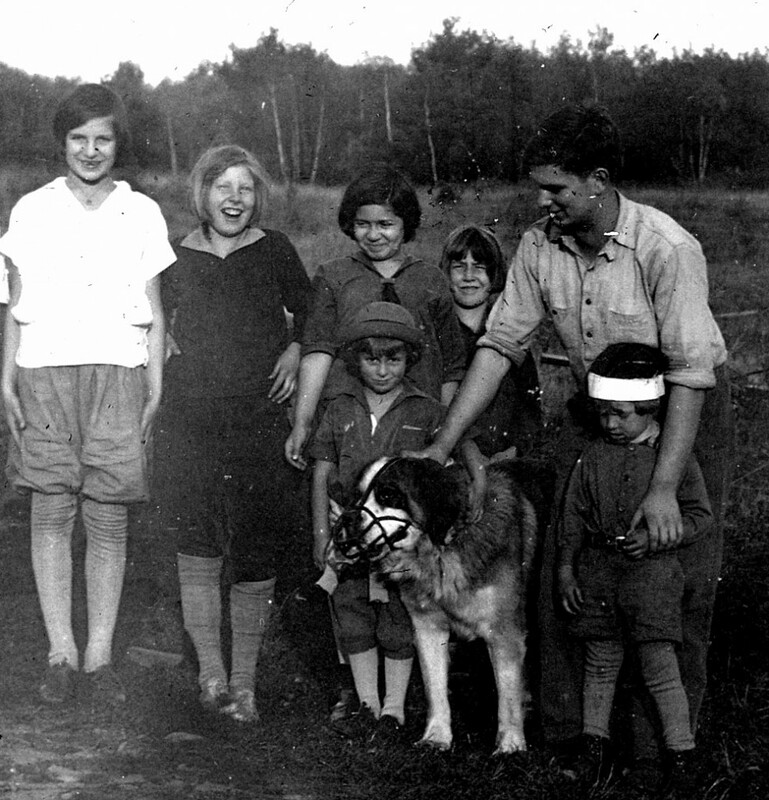 There is a photo of Shirley Sanders with several children from Eldred with my dad and his St. Bernard dog King. The group had gone swimming behind the library one day when King got in the water and they had a hard time getting him out. Starting Tuesday, November 3, Garfield worked 11 days for Walter Tether. As that job was ending, Garfield went to the Scouts to see if they had work for him. Mid-month Garfield worked some more on his own home. He took the partition out of the front room and laid some floor. He bought sheetrock and worked on the front room, including on a bay window. On Thursday, November 19, Garfield and Bill Meyers Sr. put the roof on Garfield’s garage. Mary Sergeant, Kate Love, and Kate’s mother stopped by. Friday Garfield put the entry on his new back porch. Paul Knorr’s man changed the lights around on the porch. Saturday, November 21, started off as a clear, warm day. It had been many years since there had been such a warm fall. A week later the first snow of the year fell. Garfield did some more work for Doc Gutfruend. Ella’s dad Frank Sergeant gave her some dahlia bulbs when he visited on Tuesday, December 1. Jim went up to Averys to play on Saturday. The following Tuesday Bill Meyers, Garfield, and Clinton cut firewood for the Leavenworths. The chickens must have been laying as Kate Love stopped by for eggs on the Sunday, December 13. In the middle of the month Garfield made two chairs. Ella made some Christmas candy. A package arrived for Ella from her sister Hazel, four days before Christmas. Garfield was still making chairs on Tuesday, December 22. 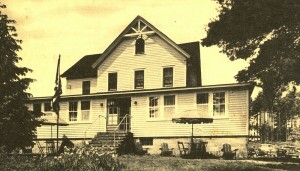 Ella and Clinton visited her father Frank at Highland Lake. Friday, Christmas Day, Garfield and the children visited their Sergeant grandparents to say Merry Christmas. Ella stayed home and cooked a two-year-old turkey for dinner. Saturday they made 55 pounds of sausage. Monday the men cut more wood for 1932. Clareta Kuen and Charlie Sergeant visited. Clara and Anna spent the evening with Clareta. (Charlie and Clareta would marry in 1937. )—Excerpt from Farewell to Eldred.